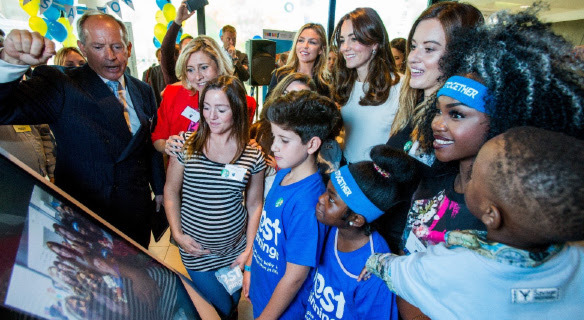 The Duke and Duchess of Cambridge and Prince Harry were at the Olympic Park on Monday (16 May) for the official launch of their new mental health initiative, the Heads Together campaign. The royal trio are hoping to break down the stigma surrounding mental health with their new campaign, and help people feel more comfortable discussing mental wellbeing, as well as providing the tools they need to support friends and family. Giant iTab are proud to support the ‘Heads Together’ campaign. 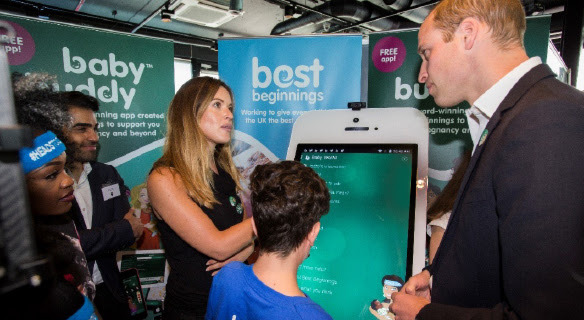 We were delighted to be invited by the charity Best Beginnings to provide one of our Giant Smartphones to showcase their multi award-winning Baby Buddy app that supports families on their emotional and physical transition to parenthood. Best Beginnings has already supported more than 2 million families across the UK and with more funds they can enable more families to give their children the best start. “A huge thank you to the whole team at Giant iTab for their pro-bono support at the Heads Together launch event on Monday. Their awesome Giant Smartphone brought Best Beginnings’ stand and our award-winning Baby Buddy app to life. The giant phone is absolutely brilliant – it’s just so inviting. 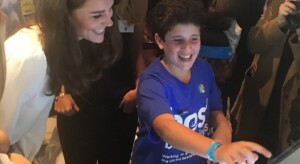 As I had hoped, their Royal Highnesses The Duke and Duchess of Cambridge spent time exploring our Baby Buddy app on their Giant Smartphone and its many interactive features. It was really visual and so much fun that we aquired great news coverage too”! Alison Baum, CEO Best Beginnings.